UFC President Dana White summed up UFC 223 perfectly. UFC 223 became one of the craziest, most dramatic weeks in UFC history. From Thursday’s Media Day featuring Conor McGregor, to the seemingly endless opponent swaps for Khabib Nurmagomedov on Friday, there was never a dull moment in Brooklyn. Yet after all that, the event made a gate of $3 million, becoming the No. 1 highest grossing live event in the history of Barclays Center. White praised Nurmagomedov for staying on the card and fighting whomever the UFC could find to put against him for the lightweight title. Four different fighters were scheduled or rumored at some point on Friday to fight Nurmagomedov. In the end, it was Al Iaquinta who got the nod to help save the UFC 223 main event. One thing that remained certain all week was the co-main event. Rose Namajunas was poised to prove her UFC 217 upset was no fluke, and Joanna Jedrzejczyk appeared laser-focused to take back what she believed to be hers. The must-watch co-main event rematch became a stable presence to an uncertain event. 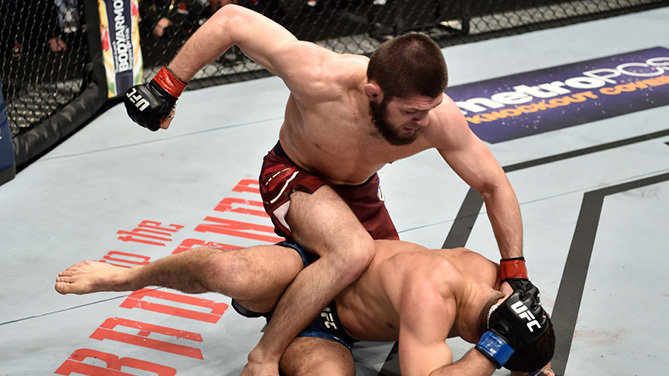 Through years of misfortune when it comes to scheduling the big fight, Khabib Nurmagomedov finally stepped in the Octagon with the belt on the line. And the result was what many have been expecting all along: dominance. Nurmagomedov out-struck Al Iaquinta, 172-43 and scored five takedowns in the first two rounds alone. Nurmagomedov even showed off a new area of his game. With the fight clearly in his control after Rounds 1 & 2 (he outstruck Iaquinta, 60-5), “The Eagle” only earned one takedown in the final three rounds and instead worked Iaquinta on the feet with a relentless left jab. It was almost as if he wanted to prove to everyone he had another dominating element to his game. Confident words from the champ, who just went the five-round distance for the first time in his UFC career. Rose Namajunas took the belt from Joanna Jedrzejczyk fair and square when the two first met at UFC 217. But there were reasons to believe the longtime champ would take her belt back Saturday at UFC 223. She left no doubt on Saturday. She picked the former champ apart in the opening two rounds. And when things were tilting Jedrzejczyk’s way in Rounds 3 and 4, Namajunas responded with a dominant final round – the first time she went the full distance in her UFC career. Jedrzejczyk had dismantled most of the division en route to five consecutive title defenses. So with Namajunas proving to be the superior, the sky is the limit for her legacy in the division. Karolina Kowalkiewicz’s impressive performance is a giant step in the direction to get back in the mix for a title shot. Kowalkiewicz displayed a fierce strategy, landing big strikes from the clinch and standing unfazed by Felice Herrig’s counter punches. The win is Kowalkiewcz’s second in a row. But it’s her fight resume that gives her as good a chance for a title shot as any strawweight contender. At UFC 205 she gave Jedrzejczyk as big a test as any during the former champ’s historic run. More importantly, she’s the last fighter to defeat Namajunas. Jessica Andrade and Claudia Gadelha are certainly in the mix as we look ahead to the next strawweight contender, but allowing Namajunas to avenge her last loss may take precedent – which is good news for Kowalkiewicz. It’s no wonder Zabit Magomedsharipov has had trouble finding a ranked opponent. After an astounding Fight of the Night performance against Kyle Bochniak, the highly-touted Russian prospect claimed no one wants to fight him. Now we know why. Magomedsharipov had the crowd ooh’ing and ahhh’ing with flashy leg kicks and takedown attempts. He remained poised and made dodging Bochniak’s uber-aggressive attack look easy. At 3-0 with bonuses in every appearance, it’s clear the 145-pounder is going to make waves in the division. A matchup with Yair Rodriguez – who Magomedsharipov called out after his win – would be a must-watch contest featuring two of the most dazzling fighters on the UFC’s roster.